FastPass+ is not only the future of trip planning at Walt Disney World, it is the present. For those of you who have grown familiar with FASTPASS since its introduction in 1999, FastPass+ is a similar system although using more current technology. 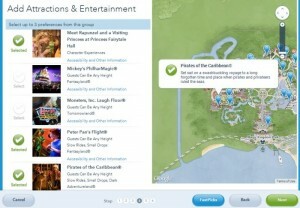 In short, what FastPass+ does is allow you to make a reservation for a ride or show at Disney World from a computer, smart phone, or in-park kiosk. So, how does all of this work? The answer is…it depends. Disney can’t just make it easy, can they? There are a few different options depending on where you are staying and what type of ticket you have. If you have not purchased park tickets you will not be able to make FastPass+ reservations. 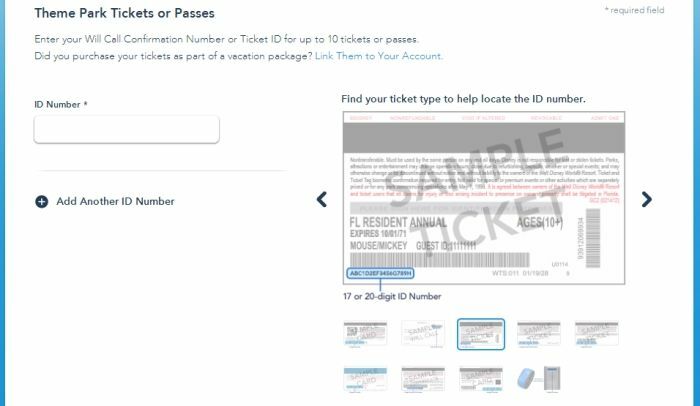 – Staying at a Disney World resort: You can make your FastPass+ reservations 60 days in advance in addition to a 10 day grace period. For instance, if your check in day is December 1, you may make FastPass+ reservations for your first day on October 2. The 10 day grace period means that on October 2 you may also make reservations for all days up to December 10, even though they are more than 60 days away. 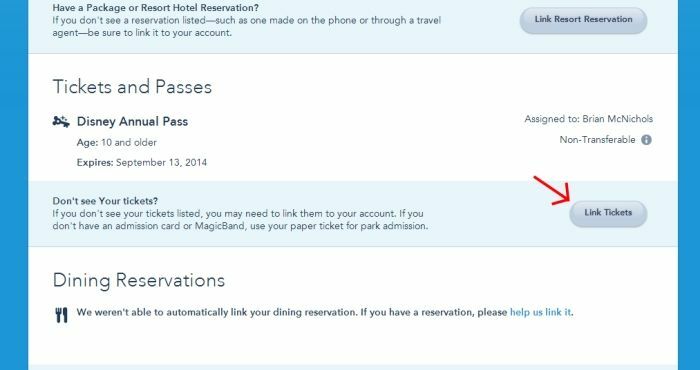 – Staying at a non-Disney resort: You will be able to make your FastPass+ reservations 30 days in advance. – An Annual Pass holder: You will be able to make your FastPass+ reservations 30 days in advance. 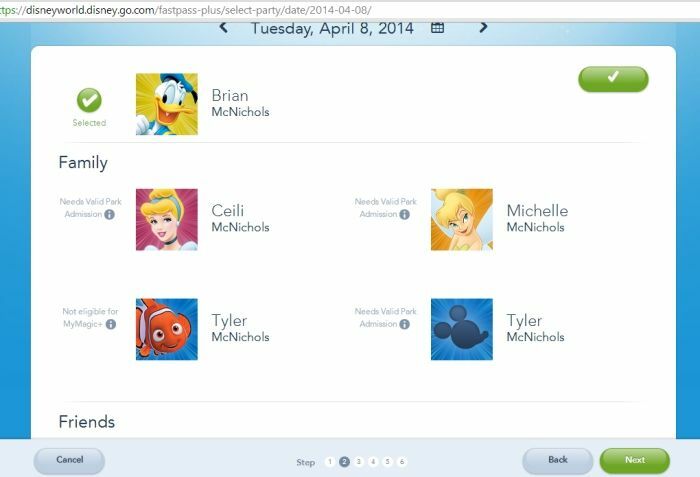 FastPass+ reservations can be made from home using either an internet-accessible computer or a smartphone. Unless you are very comfortable with the My Disney Experience smartphone app, we suggest you make your reservations on a computer via the Walt Disney World Website. To do that takes quite a few steps, but is very easy to do. Click on “Sign in or Create Account” on the top left as pictured in photo 1. If you already have a Disney account, sign in. Otherwise, select “Create Account” as pictured in photo 2. If you already have a Disney account skip to step 6. 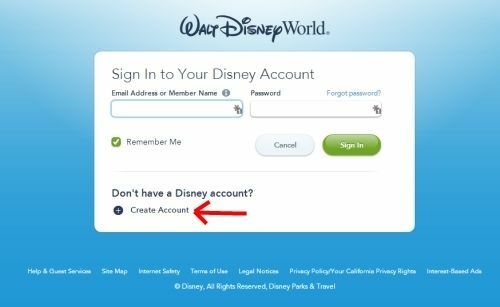 You will need an email address in order to create an account with Disney. If you do not have an email address, we suggest setting up a free Gmail account, although there are also other free services such as Yahoo and Hotmail. Now you will need to link your tickets to your Disney account. 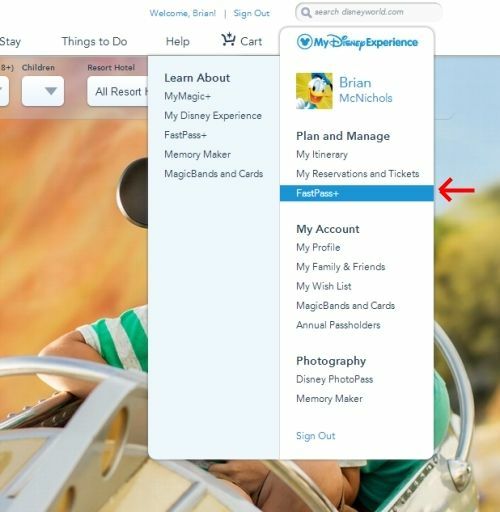 From the main page, hover the mouse over “MyDisneyExperience” at the top right and click on “My Reservations and Tickets,” as pictured in photo 3. On the next screen, scroll down until you see the header “Tickets and Passes.” If your tickets are already listed there, go back to the main page and skip ahead to step 10. If not, click on “Link Tickets” as pictured in photo 4. If you have a Magic Band you can type the 12 digit number from the inside of it in the box on the left. 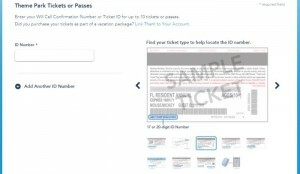 Otherwise, scroll through the various types of tickets (as shown in photo 5) to find the one that looks like yours and type the highlighted ID Number into the box. Click Next. Before you get back to Fastpasses you will need to assign the ticket to yourself, which is done easily by checking the mark next to your name then clicking Next. Now we are finally ready to make some FastPass+ reservations! From the main page, hover over “MyDisneyExperience” at the top right and click on “FastPass+,” as seen in photo 6. 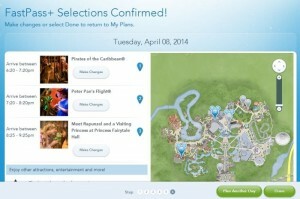 The next screen will ask you to select a day that you would like to choose FastPasses for (photo 7). You will only be able to select days that you are eligible for FastPasses. 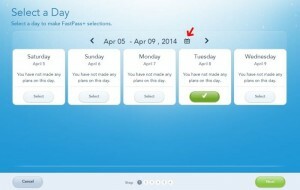 Clicking the calendar icon (indicated by the arrow in the photo) will allow you to select a specific day. Once you click “Select” on a day, the oval will turn green. Click Next. Next, select who the selected FastPasses will be for as shown in photo 8 (Note that only those who have tickets assigned to them will be eligible). Click Next. 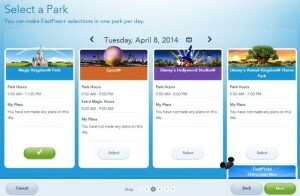 On the following screen, shown in photo 9, you can select the park you want the FastPasses for. As of this writing you may only select FastPasses for one park per day. Click Next. Finally, it’s time to start selecting FastPasses! 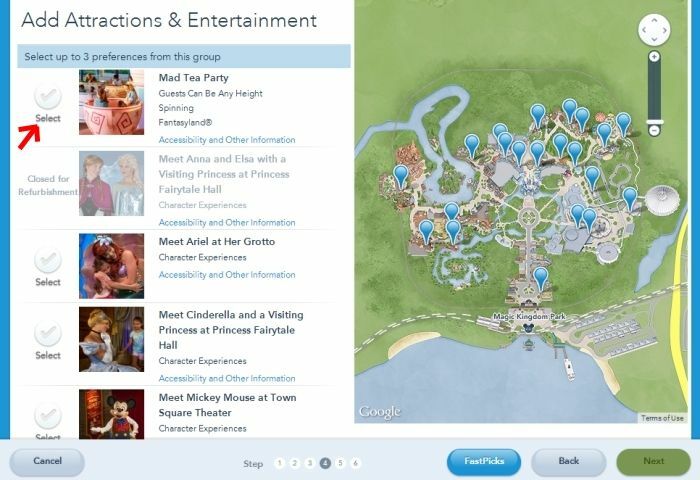 As shown in photo 10, the selection screen is split into two sides with the rides, shows, and character meetings on the left and a map on the right. Scrolling through the list on the left will show you all of your options. 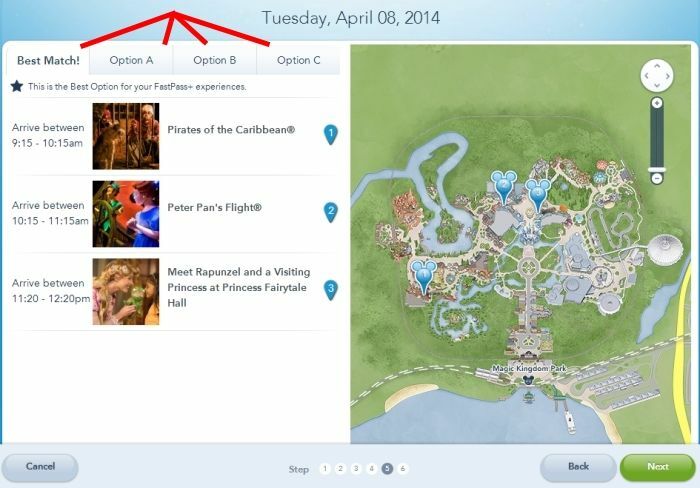 Clicking on the “Select” checkmark (the arrow in the photo) will select that FastPass+ for you. If there is no “Select” checkmark, that FastPass+ is not available for that day. As you select your FastPasses, the checkmarks will turn green and the map will move to show you where that particular attraction is, as shown in photo 11. You are allowed to select 3 FastPass+ reservations in any one day and a weird quirk is that you must select 3. If you only select 1 or 2, Disney will automatically assign you a third, so you are better off just picking 3. Once you have chosen your 3, click Next. The next screen, shown in photo 12, gives you four options of FastPass+ times for the attractions you selected. In general, the options will give you a range from all morning times, to all afternoon times, to times spread throughout the day. By clicking on the tabs at the top (indicated by the red lines in the photo) you can see the different options. When you see one you like best, click Next. Congratulations! You have now confirmed your FastPass+ reservations (photo 13)! If you would like to make more reservations for a different day, click “Plan Another Day” and go back to Step 11. Otherwise, click Next. How do I See What FastPass+ Reservations I Have? 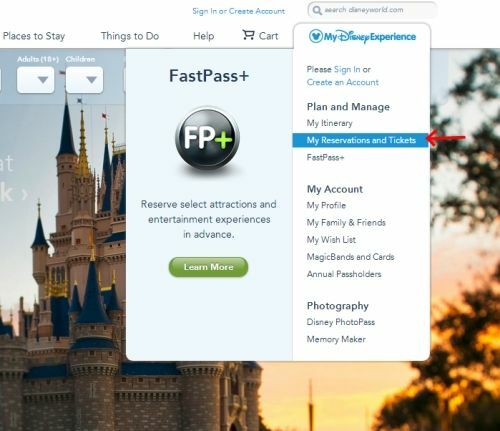 Compared to all the steps you just went through to make your FastPass+ reservations, checking them is easy. From the main screen, hover over “MyDisneyExperience” and click “My Reservations and Tickets,” as shown in photo 3. 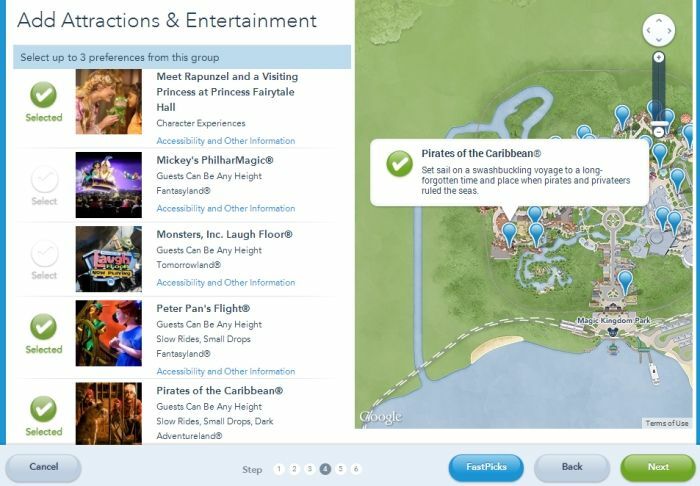 Now, when you scroll down to the FastPass+ section you will see all of your FastPass+ reservations, as shown in photo 13. That’s it! Only 17 steps and you are all set up with your FastPass+ reservations. Coming next will be a guide on how to use your smartphone to make changes or new reservations. Please let us know if you have any questions. Epcot IllumiNations: Is It Worth Your FastPass+? Just did this yesterday, it was really easy once you decide which day to go to which park! That was much more difficult! Haha! ONLY 17 steps and 13 photo-illustrations? This local, former annual passholder (who doesn’t have a smartphone) won’t be spending the new $17 parking fee to uber-schedule a day of “fun” any time soon. Point of note, though: If you have bought your tickets through the website, steps 1-9 are already done for you. if you’re an AP holder, I suspect you have to still do them the first time but not for subsequent visits? I’ll be making reservations next weekend for our trip in June. Is there any way to choose individual times for each attraction or do you have to choose a 3-attraction itinerary as a set? Yes, as Brian said you start by choosing one of the offered options. Then you have to back to each FPP reservation and change it. Be aware that Disney won’t let you over-lap your reservations times. I found that I was best off choosing the option that had times not anywhere close to what I actually wanted, then I was more easily able to change to the times I did want. It does seem like a lot of steps, but wasn’t too bad once I figured out how to get what I wanted! Good Luck! Thank you so much for the detailed steps! I just do not understand why annual passholders cannot book 60 days in advance like other resort guests. It seems very unfair. I understand why you feel the way you do, but as an AP holder let me give you my perspective. We pay a lot (more then $700) for these passes. It used to be that we got quite a few more benefits (greatly reduced room rates, deeper dining discounts, deeper merchandise discounts, etc.) than the day or multi-day ticket holders, even those who stayed on-property, but over the last several years we have seen our benefits become less and less. There is something to be said for the loyalty that AP holders have. We tend to spend more money overall on lodging, food and merchandise because of the many days we do go to the parks. Let me give you an example. Even when we stay off-property, we tend to go to the parks at least 20 – 25 days in a 12 month period. Translate that into lunches, dinners and merchandise and I’d bet we spend at least $2500 – $4000 a year in the parks (not including tickets, lodging and parking). Can you say the same about a non-passholder who stays off property? I’m thinking they don’t spend nearly that much time or money. Include the # of AP holders who stay on property and we spend even more. Lastly, many AP holders schedule last minute trips, so allowing us to schedule FP+ at least 60 days out encourages us to go even more frequently. More days in the parks equals more money spent. I don’t think it is asking too much to get a head start on booking FP+. 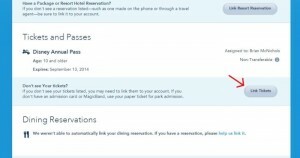 Why make the AP holder “cheat” by booking and then cancelling a room? Unless they are going to remove all those FP+ reservations after a cancellation, then I imagine Disney’s cancellation rate will go up and they won’t really know why. A FL resident season pass costs about as much as a 4 day pass for the general public. So, the passholder is sometimes a big spender, and sometimes, the passholder is aggressively trying to get into the parks the cheapest way possible and get all the benefits associated. I’m an AP who is not local. My family’s passes cost over $6000 last year plus all the gas money (8 hours each way), hotel money (on site and off depending on the trip) and food and merchandise money we spend. Yes, my per day cost of being at the parks is lower but by dedicating all my yearly vacation dollars to Disney in advance I do feel like I should I be able to book my FastPasses in advance. Hello Ella, I’m not local either, I’m in California and have the premier pass, usable in CA & FL parks. I have to plan in advance when going to FL, it would be nice to have the option of the FP+ more than 30 days out. It does cost quite a bit to get to the east coast, I try at least twice a year. I get to Disneyland in CA twice a year and only for a few days. If we’re able to book a stay with a minimal deposit and then cancel, then we can effectively book 60 days out. It’s just a “hassle” not an actual restriction. Has there been any information released regarding FPP+ and hard ticket parties such as Mickey’s Not So Scary Halloween Party or any of the runDisney parties? Will FPP+ be offered for these types of events? No FP+ during parties if it is like last December during testing. THANK YOU for this primer! I will be using it soon and I love that you took it step by step. 1. Do you know what time on Friday I can start? I am planning to get Fastpass+ for Anna and Elsa and I imagine those will go quickly. I was wondering if I should stay up late Thursday for the possibility that I could make them just after midnight. 2. I only want to make the Fastpass+ reservation for Anna and Elsa for my daughter and I. My husband and two boys will do something else. How should I go about doing that? Should I make the reservations for all 5 of us, and then change the 3 of them to something else in a later step? (Although I’ve read it can be difficult to get reservations for Anna and Elsa for a bigger group like that.) What would be the other option–make 3 Fastpass+ reservations for my daughter and I, and then 3 for my husband and boys? And try to match up our other 2 to their other 2? Make sense??? Okay, number 1: The dining reservation system opens at 6am ET online, so I assume at least by then. I know the FP+ system is accessible earlier than that, but I’m not exactly sure when it turns to the next day. Next time I’m up that early I’ll check it out. No. 2: If you want 2 out of the 3 FPs to be for your whole family I would make them all together and then adjust for the boys afterwards, just so you don’t have any time overlap issues. As you said, Anna and Elsa can be tricky, so if you can’t get anything for 5 then try 2. In my research for this I have been seeing Anna and Elsa FPs at the edges of my 30-day AP window, so hopefully you won’t have an issue with availability. Your 60 (or 30) day FastPass window opens at midnight. Add to this midnight info: When I did it, I think there were a ton of people doing it then as well. The system was VERY slow and kept kicking me out. But I found when this happened, I just needed to either shut the window and reopen, or refresh the page. While it was kicking me out pretty much every time, it was saving my reservations. I do not know if some of the kinks have been worked out – with this WDW system I would guess no – but even if you are having issues at midnight all might not be lost. I’m assuming midnight Orlando (EST) time? I just made fastpass+ reservations for my upcoming trip in May. I am an offsite guest so I had only the 30 day out window. You can start reserving at midnight EST 30/60 days before you go. Like Jane, I also believe there were a lot of people online making reservations as soon as the window opened. I literally saw the times disappearing before my eyes. I did it at midnight exactly and some of the times I wanted were already gone (although I have 7 in my party so that may have affected my results). Is there a limit to the number of fast passes planned per day? How does it work for the fast passes for parade shows; does it get you a specific spot/area/seat? I’ve done MK evening parade, EPCOT fireworks, and Fantasmic via FP+. For MK parade, there’s a viewing area between the flower boxes on the north end of the circle where the walt and mickey statue is located. They clear the area about 20 minutes prior to the “time” you’re supposed to get there. It’s a really nice way to view the parade, but unnecessary to have. There’s plenty of ways to watch that 2nd parade. Cast members with ipads and scanners check your reservation and let you into the area. Similar for fireworks FP+ which we did for EPCOT fireworks. For Fantasmic, they have separate lines up the big ramp, and 9 or 10 mickey heads to scan wristbands and let people in. The other line is held for a while, and then let into only the 3 sections on the right. Both reservations were easy to get, and it was really nice to have an area protected from incursion by late comers as well as having more room in general. For the benefit of all guests, it’s really bad. It ropes off areas and reduces the capacity to view for everyone so that people who burn a FP instead of getting one for soarin or TSM. Because I have alternative ways to get on TSM and Soarin and pretty much all “rides” (DAS, baby swap, or just getting there early) to a fastpass, I only use FP+ for shows. The last time I was at Fantasmic, they had 4 sections reserved for FP+ people, 2 in the middle for dining package (large extra fees involved), and 3 on the right for standby. So, officially, standbyers don’t have even a chance to have a good seat for Fantasmic. That’s ridiculous. That means that literally 2/3rds of the attraction capacity is set aside for the “special” people who did something extra. Generally, adding FP+ for shows means that if you’re interested in a show and want to see the next show after you get in line, you’ll need a FP+. Unless it’s a low crowd level. But when it’s a low crowd level, they reduce the number of times they do fantasmic, and main st electrical parade, and some showings like light motors action stunt show and indiana jones. You get 3 fastpasses per day and only at 1 park. If you use them for rides, you can’t use FP+ for shows. If you want to use FP+ for toy story, you can’t use it for Fantasmic. For the parades and fireworks, you get let into an “area” and then reserve your spot among the other FP+ people. It doesn’t really save time, but it’s less stressful because CMs are keeping the larger crowd at bay. At Fantasmic, it’s awful. FP+ gets you what you would have gotten in the past without FP+. We had to be there 90 minutes or maybe 110 minutes early to get into the middle section, and we used FP+. It didn’t save any time or feel special. But if we were in standby, we’d be forced into the 3 sections to the right. 2/3rds of fantasmic were reserved. We are going with the grandparents, staying in different resorts, so we have separate reservations. I have heard it is difficult but possible to link separate parties, but no one has explained why it is difficult or how to do it. Can you do a blog on that aspect? Thanks! It’s easy to create 1 party under 1 login. But if everyone in the party has their own login, it’s best if a person that knows what they’re doing sets up all the accounts. 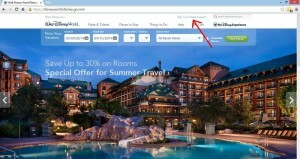 It’s not hard to put multiple room reservations into a mymagic+ account. But the system does check that you have valid admission and a valid room reservation in order to make a FP+ reservation. Nice job Brian… Perfect timing too… I make FP+’s in two weeks.. I think all this is insane…This is suppose to be a vacation!! Disneyworld has always been a hassle. The whole idea of the unofficial guide book in my opinion was as a guide around the hassles. ESPECIALLY the hassles that the “official” guides don’t even alert or admit to, and certainly don’t provide a solution. One way to forgo all the issues: Go to Disneyworld for 12 days in a row, getting there for rope drop. Then just do what you want, wait in line, and you’ll get everything done. But I’m not a fan of trying to make a ride reservation 60 days out. Especially because I’d want to make a show reservation and you can’t count on the weather. hello Brian and all, great subject & info! happy to say all my whiging (whining)out so far was unnecessary re fastpass. so good thing to know disney fixing stuff as they go along (including allowing dolphin/swan 60 day option along w rest of onsite hotels). my question is this: saw the blog on this archive, re fp+ for parades, fireworks. i had b4 decided to not use for the electrical parade because sounded not worth it. but this other blogger mentions that keeps the crowds away, keeps the area easier to be in. that actually sounds worth it now to me, since traveling w 2 and 4 yr olds etc. then maybe we can just leave area after parade and head f exit, and take the ferry while castle show and fireworks? got that idea f your wonderful unofficial guide (using it f may yrs). actually maybe thats a silly idea f us because we would have to take the ferry right back to catch bus at exit area, f dolphin. or better way yet, we should just take a taxi f trans and ticket area? or is there a ferry i think to poly, and take taxi f there? kind of a complicated question i guess, but id rather be complicated now than during the crush of people that night. we are traveling mid aug no choice f any other time to go! thanks for all the wonderful info! At EPCOT, the FP+ viewing area is at the edge of the lake behind the gift shop to the west at the north side of the lake. You can walk from there to swan/dolphin when crowds go down out the international gateway, or take the boat. That was a great experience and best viewing of Illuminations. Only drawback: Distance from the concert series pavillion outside america pavillion and the timing between those concerts and the start of the fireworks. If you want to use a cab to avoid disney transport after the magic kingdom, use the walkway to the contemporary and take a cab from there (not the TTC; as that involves disney transportation). The electrical parade FP+ area was REALLY uncrowded. But it was also the 11 pm parade. The EPCOT fireworks viewing was also really uncrowded, and one of the best viewings of illuminations I’ve had. Fantasmic only has 3 out of 9 sections for standby, so getting a FP+ for that is basically needed just have the privelege of getting to a “normal” seat 110 minutes early. If you had FP+ and arrived at about 25 minutes prior to show time, you sit on the end section. If you have standby, and arrive any time after 90 minutes prior, you don’t get in, and even with arriving super early to standby, you still sit in one of 3 sections to the “right” as you face the “stage”. The best way out of MK when the hub is JAMMED packed is to go around and into tomorrow land and go behind the laugh floor towards the Plaza restaurant. If the hub is JAMMED and not moving, Disney opens the back stage area behind main street and allows people to walk behind the shop from the area by the plaza restaurant bathrooms to the gap between the main st shops and the tony’s restaurant and mickey character greeting. Do NOT count on exiting the park easily from the FP+ viewing area for the electrical parade. If that is your goal, watch the parade south of the shops on main st in front of tony’s restaurant or near guest relations. If you get a spot in the FP+ area for the parade prior to the fireworks it will be more crowded, and as soon as the ropes are down after the parade, tons of people will rush in to fill the void for castle show and fireworks viewing. (Although the FP+ viewing area for the parade has an obstructed fireworks view because you’re too close to the castle). That area becomes nuts between the parade and fireworks, and when the parade goes by, your FP+ sanctuary is dissolved and gone leaving you stranded in the middle of a crowd that feels less than favorable to those people who got into that roped off section. That’s the earlier night parade. The later parade has nothing following the parade. If you opt to use the copy function, stick to the website and not the app. I was able to get an Anna and Elsa FP, but at slightly different times, which subsequently threw off my times for the rest of the day. I wondered if the copy FP function would fix my problem. I tried to copy on the website and got an error message. I tried the app and it seemed to work great…until I realized that no FP+ were available for Anna and Elsa, so the app took the liberty of canceling the reservation they did have and rescheduled for something else. I realized the problem immediately and was able to put everyone back where they started. Not. Cool. I am staying offsite and my 30 day window is April 30. It is my understanding that I will need to make my FPP on each following day even though my tickets are linked and it shows a 6 day MYW. I have 9 people that I manage. In step 12 do I click everyone in my party? I have read where sometimes breaking the party up and looking for times that overlap is better for such a large group. Also any word yet on when Disney may begin allowing guest to access additional FPP once they have used their first 3? This would also factor into how I plan my day. Thanks so much for all this info. I’ve been a little nervous about using the new system and this is very helpful. Has anyone else tried to reserve FPP with a large group – 10 or more? It’s nearly impossible. The software ‘assumes’ that the whole group will go on every FPP together and even if you are able to break up the groups, the software also assumes that the same configuration of people will book the same attractions the whole day. My Dad spent hours online trying to get it to work and still has to call Disney today to get it right. I realize the system is new and for the majority of people in smaller groups, this won’t be an issue. But for large groups, it’s a huge hassle. Did I read correctly that park guests with FP+ reservations may now collect additional FPs after they’ve used their initial three? If so, do you now suggest that we make our FP+ reservations earlier in the day – in order to be able to “reload?” I’d be curious when folks think the optimal time would be to gain advantage from FP without waiting too long? My family will be in Orlando in July. We are staying on property for 5 days, then switching to an off-property resort. We have 5-day Disney World tickets which we were planning to stagger with other activities (Universal, pool day, etc.). I just made my FastPass+ reservations for two of our vacation days. However, it seems I can only make my FastPass+ reservations during the time I’m staying on property. But in the article above, you suggest a 10-day window. If we’re staying for 5 days, and I have 5-day tickets, is it the fact that I only have 5-day tickets that it’s not letting me book beyond my on-property stay, or are the other days considered off-property and I’ll be allowed to use them within the 30-day window? If my tickets are valid for 14 days once I use them, shouldn’t I have 14 potential FastPass days? I’m trying to figure out the system so I know when I can lock down the other three days. I’m gonna be bummed if I can’t book FastPasses until I get to the Parks! In case anyone else is curious about my question above regarding the window for booking FastPasses when you’re switching from on-property to off (because, like us, you have to transfer to a convention), I received an answer from the Mom’s Panel. Supposedly, the FastPass window will open 30 days in advance, just like a normal off-property guest. I would assume that 30-day window will open 30 days from the day you want to book your first FastPass.